You know that feeling you get when you’ve just finished an amazing book? You loved the plot and grew attached to the characters. The central problem has been resolved, though smaller ones may remain up in the air. Then you learn that the author has released a sequel or that the book you just read is in fact part of a series, and the fun does not have to end just yet! Books in a series or sequels to books are a great way to engage readers at all levels, particularly reluctant readers or struggling readers. The familiarity of characters, setting, plot line, and the type of problems the characters face allow the reader to feel like they have already done some of the hard work and can pick up where they left off. In a post earlier this week, I wrote about Because of Mr. Terupt. 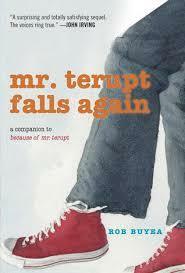 I recently read the sequel Mr. Terupt Falls Again by Rob Buyea. After a challenging fifth grade year, the students in Mr. Terupt’s class have the opportunity to loop up to sixth grade together. The book follows the same lovable characters as they navigate another action-packed school year. As a sequel, this book did not disappoint. Same great, complex and realistic characters. Peer pressure is front and center. Overall the same important themes emerge, the importance of sticking together, standing up for what you believe in, taking time to understand the point of view of others, etc. However, it is important to note that this sequel features a lot of mature topics, including substance use, smoking. Also physical development in girls is also a topic that keeps coming up, as the characters in the story are in sixth grade.Based on the content of the book I’d recommend it for middle school students rather than those in elementary school. The third book in the series, Saving Mr. Terupt, was just released, and I am looking forward to reading it. Stay tuned!